1. Always rinse your hair with cool water after you condition. The cooler the water, the better. This will help seal the cuticle and give your hair a beautiful shine. 2. When towel drying your hair, never rub your hair in the towel. Always wrap your hair and squeeze the excess water out. This will prevent the hair cuticle from opening up and looking frizzy. 3. When using styling products to help protect your hair from heat, always make sure to use the right products for your hair type. For fine hair, use a lightweight anti-frizz milk or lotion. For coarse hair, use a treatment oil to give your frizz-prone hair the moisture it needs. 4. When blow-drying, use a natural bristle brush, it will polish the hair shaft and smooth the ends with little effort. 5. Invest in a professional blow dryer. Preferably one with ionic technology and speedy drying time. The heat and ionic technology will help to seal the hair cuticle leaving your hair looking smooth and shiny. 6. If you use a flat iron, keep it on the highest heat. 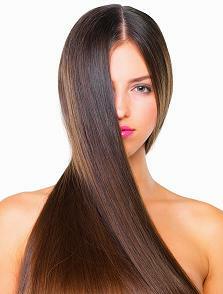 Lowering the heat will do more damage because you will have to run the flat iron over your hair multiple times. 7. Use a deep conditioning mask once a week, it will help replenish any moisture that has been removed. 8. Get your hair trimmed every eight weeks. Cutting your hair regularly will prevent hair from splitting or breaking on its own.